Katherine W. Rinne, "Gravity, topography and the Acqua Felice fountains of Rome", in Column 5, 10 (1996) 23-30. The Acqua Felice, re-uses the springs and route of an ancient Roman aqueduct, the Aqua Alexandrina. It was restored under the patronage of Pope Sixtus V, completed in 1587, and renamed by him. It arrived in Rome at the top of the Quirinal hill (elevation 59 meters above sea level) at the newly completed Fontana del Mose (Moses Fountain). 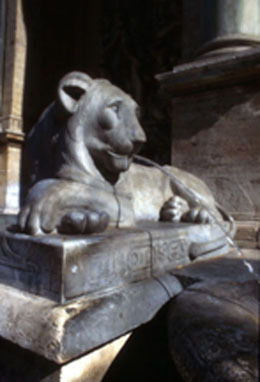 This new water supply spurred the development of more than twenty new public fountains designed between 1587 and 1614. Rather than adopt a traditional analysis of iconography or patronage, this article examines the role that gravity and topography played in the design of the new fountain system. Together the law of gravity and the specifics of each topographic setting will be demonstrated as key determinants in the evolution of not only each individual fountain, but the in creation of an integrated water distribution system for Baroque Rome. Copyright, Katherine W. Rinne 2001.